Question: A friend told me Facebook allows you to make your cover photo a video. Is that really possible? If so, how can I do it? Answer: Yes, you can, and it's pretty easy, too. Before you do it, though, note that your video must adhere to certain specifications. First, the content must not violate Facebook's policies. The video must be at least 820 x 312 pixels and between 20 and 90 seconds. 1) Login to Facebook and navigate to your profile. 2) Hover over your current cover photo and click Update Cover Photo. 3) To upload a new video, select Upload Photo/Video. To select a video you've already uploaded to Facebook, select Choose From Videos. 4) Select the video you want to display. 5) Reposition the video as you would like it, then click Next. 6) Choose a thumbnail option for your video, then click Publish. Written on 31 December 2018 . Happy New Year! While we look forward to another great year in 2019, I am very proud of the accomplishments our team completed in 2018. 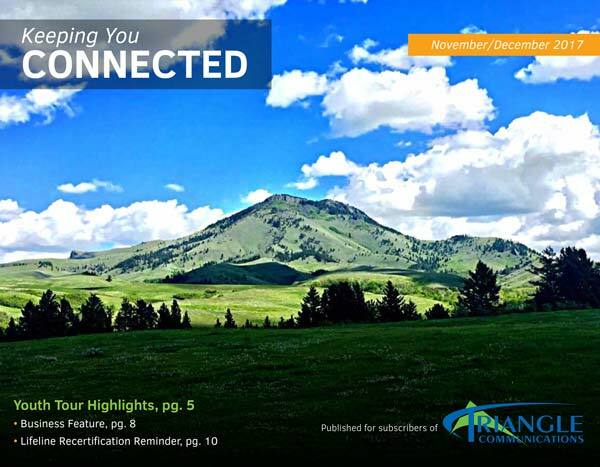 We delivered on four new exchanges being built out to Fiber to the Home in 2018, Box Elder, Harlowton, Melville, and Simpson! We listened to our members and have some exciting new offerings. Introduced in 2018, Advanced Wi-Fi is one of our great new services. If you sign up for Triangle’s Advanced Wi-Fi, we install a state-of-the-art router, assess the signal in your home, check for interference to make sure you have coverage throughout your entire home. Not to mention 24/7 support and advanced security measures. Save yourself the headache of your family complaining about not having a Wi-Fi signal and give us a call. Question: I need to set up a new Facebook password. How do I do this? Answer: Facebook makes it simple to take care of this issue. Simply follow the applicable steps below. Question: A few of my Facebook friends sent me messages saying they got a Facebook friend request from me when we're already friends, and that I may want to check my account and forward the message to others. What should I do? Answer: It's entirely possible that your friends did get a bogus friend request from someone who created a fake account with your name and photo. It's easy enough to find out; simply do a search for your name on Facebook and see if another account with your name and photo pops up. If that's the case, then, yes, you should inform your Facebook friends that there is a duplicate account that may be trying to friend your friends. You should also click on the Report This Profile button on the fake profile to report it to Facebook, which should shut the account down within 24 hours. A duplicate account isn't necessarily harmful to you, but the person who created it may be trying to get others to friend them so they can mine those accounts for personal information. Another possible scenario is that your friends simply forwarded a message they got from another friend saying, "I got a bogus friend request from you. Forward this to everyone you know." Before you go spamming all your friends, you might want to message these friends back and ask if they really got a duplicate friend request from you, or if they just forwarded the message because they were asked to. SHORT TUTORIAL/FAQ - HOW DO I MAKE SURE I SEE FACEBOOK POSTS FROM THE PEOPLE I WANT?